Want it by Wednesday 24th April? Order within 3 days, 8 hours, 36 minutes and choose Royal Mail 24 Hour Delivery at checkout. 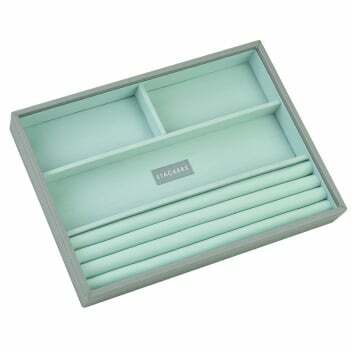 On trend and elegant this beautiful Classic 4 Section Stacker is ideal for holding bracelets, necklaces, earrings and rings, place it under your grey and teal lidded stacker for a pretty and practical jewellery storing solution. Stackers allow you to expand your jewellery box as your collection grows, build layers by perfectly stacking different styles on top of each other. We think its a perfect way to look after the jewellery you love.